Paul McGann as the Doctor in The Chimes of Midnight. At its very core, Doctor Who is scary. …and even from time itself. 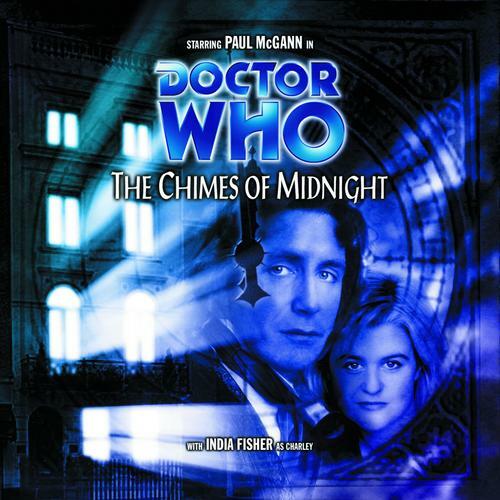 The Chimes of Midnight is hands-down, full-stop, one of the best Doctor Who stories in any medium; TV, audio, comics, or novels. It’s well-written. It’s superbly acted. It’s got moments of comedy. And it’s absolutely terrifying. Robert Shearman uses the audio format to lay out a creepy premise in a haunting settin, and Paul McGann and India Fisher, along with the supporting cast, put in outstanding performances, all adding up to what is simply a classic masterpiece of the audio medium. Once again, the TARDIS refuses to take Charley to Singapore on New Year’s Eve, 1930. 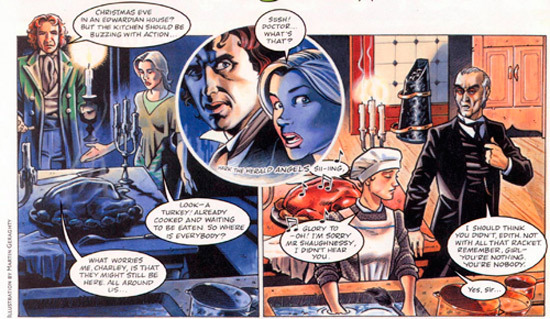 Instead, the TARDIS lands them inside the larder of a Victorian manor on Christmas Eve, 1906. The turkey is the biggest the market had, and the cook has made her famous plum pudding; after all, it wouldn’t be Christmas without one of Mrs. Baddeley’s plum puddings. When the scullery maid, Edith, is found drowned in the sink as the grandfather clock strikes 10 pm, the downstairs staff of Mr. Shaughnessy (the butler), Mrs. Braddeley (the cook), Frederick (the chauffuer), and Mary (the lady’s maid), all agree that it was suicide; Edith being quite dense and stupid, she might not have known it was very difficult to drown yourself in a sink, which explains why she was able to do it. Luckily, the Doctor is the best detective in Scotland Yard, according to Mr. Shaughnessy, and it’s lucky that he had braved the blizzard outside to attend Christmas dinner with the master who waits upstairs. But when the clock strikes 11 o’clock, another member of the staff is found dead, stuffed to the gills with plum pudding; another obvious suicide, according to the staff. And when the clock strikes midnight…it’s 10 pm again, and this time, it’s another suicide, this time by plunger suffocation. It can’t be murder, not on Christmas, no matter what the Doctor, the most famous amateur sleuth in all of London, seems to think. As the Doctor and Charley investigate the time loop and the murders, the staff continues their work. After all, Christmas is tomorrow, and it wouldn’t be Christmas without one of Mrs. Baddeley’s plum puddings. And those plum puddings have always been Charley’s favorite. I feel like I’ve given away too much just by typing out the above synopsis, but those words only scratch the surface of The Chimes of Midnight. There is so much going on in this serial, and as opposed to the overabundance of plot threads of the previous tale Invaders from Mars, these threads are slowly woven together into a story that winds the listener incredibly tight. It’s like the movie Groundhog Day meets Agatha Christie’s novel The Mysterious Affair at Styles. Everything has its place; from names written in dust to the make and model of the chauffeur’s car. Lines of dialogue becoming unnerving as they are innocently repeated. And when the Doctor, a Time Lord who has seen all of time and space, becomes unnerved, the listener can hear it in McGann’s dialogue. The script by Robert Shearman, author of the audios The Holy Terror, Jubilee, Scherzo…and also, a little Ninth Doctor TV episode called Dalek, is penned perfectly. It all clicks into place, as Shearman establishes the characters, lets them loose for a period of time, and then drops the hammer at the ends of episodes two and three. It’s very rare for the Doctor to come up against a situation where he’s completely at a loss. Paul McGann plays the part of a curious, then befuddled, then terrified Doctor. He’s enthusiastic to figure out the cause of the time loop, willing to play along when necessary with loads of brilliant lines. When the truth comes out and he realizes what’s going on…it’s amazing, and I don’t want to give anything away. I’ve mentioned that I believe the Eighth Doctor is the best ‘improviser,’ someone who doesn’t have plans so much as reactions to everything that’s going on. McGann has said that this is one of his favorite Big Finish productions, and you can hear it in his enthusiastic performance. With McGann and Fisher both at the top of their games, the supporting cast joins them in those heady heights. While this is Charley’s story, Edith the scullery maid plays a vital supporting part. She is no one, she is nothing, and she’s quickly forgotten by the rest of the staff after her “suicides,” but Louise Rolfe’s role won’t be forgotten. Her connection with Charley, both from the initial meeting and their final face-to-face, establish her – a mere scullery maid who aspires for more even as she’s beaten down by others on the staff for being dense and ugly. You can hear the heartbreak and the hope in her words as she pleads with Charley at one point. The rest of the cast are superb in their roles as well. The haughty butler, the lady’s maid who think she’s better because she works “upstairs,” the cook who rules the kitchen with an iron fist, and the crafty chauffeur. They exist to serve the lord and lady, nothing more. Even as they threaten to kill the Doctor if he tries to leave or asks what time is it, they do so with the utmost politeness. They help the Doctor with his investigations even as they blame each other…after all, they must be the murderer, they have shifty eyes. The final piece of the puzzle is the sound. From the opening lullaby, to the whistling of “Hark the Herald Angels Sing,” to the constant ticking of the grandfather clock, Barnaby Edwards does a fantastic job of using sound to creep the listener out, and that’s before the ear piercing scream that accompanies the chimes of the clock when someone dies. Final Synopsis – Scary, tense, shocking, and simply fantastic, a Christmas ghost story for the Doctor and Charley that will make the listener’s hair stand on end thanks to great performances and a top-notch script. 6/5. Next up – Sebastian Grayle: immortal, obsessed, ruthless, has come to the city to meet the Time Lord. To the Doctor, he’s a complete stranger, but to Grayle, the Doctor is an old enemy. Paul McGann as the Doctor in Seasons of Fear. This entry was posted in Big Finish Review and tagged 6/5, Big Finish, Charley Pollard, Doctor Who, Eighth Doctor, paul mcgann, TARDIS. Bookmark the permalink.